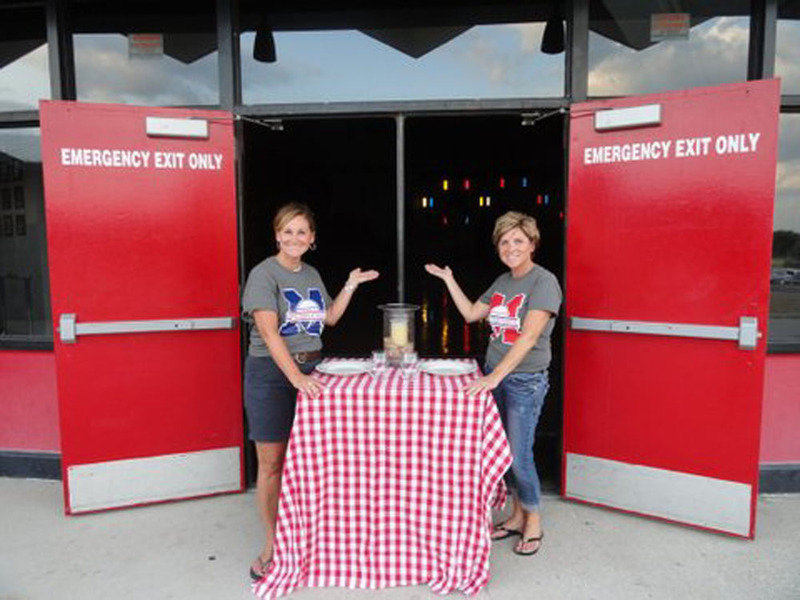 Event coordinators, Peggy Hannam and Angie Kuehner, welcome the community to the MHS Roundhouse for dinner on Thursday, Sept. 19. A new event has been added to the Marshalltown High School Homecoming line-up this year: Following the Homecoming parade and prior to coronation on Thursday, Sept. 19, the Marshalltown community is invited to the Roundhouse for a royal rally and dinner. Aiddy Phomvisay, Marshalltown High School Principal, sees this dinner as a win-win for students and the community. The dinner adds just one more piece of excitement to Homecoming week and also is a great way to raise awareness and dollars for the Roundhouse Renovation. “The incorporation of this event into our Homecoming festivities shows the community that the Roundhouse Renovation is a top priority for our student body, staff and administration!” Phomvisay said. The $5 dinner will include a pork burger, chips and bottled water. A Bobcat sugar cookie can be purchased for an additional dollar. Nearly all of the food for the event has been donated by local businesses. The donors include JBS Inc., State Center Locker, Hy-Vee, Fareway, Aldi, Wal-Mart, Jimmy Johns, Subway, Sports Page, and the UPS Store. Doors at the Roundhouse will open at 6pm, with 1200 dinners served on a first come-first serve basis. Dinner attendees are encouraged to stay for the coronation ceremony when the 2013 MHS Homecoming Queen and King will be crowned. Organizers are also selling “It’s Our House” t-shirts. The short-sleeve tees are dark gray with the “It’s Our House” logo. They can be purchased for $10 each at Sports Page or online at http://www.sportspageteam.com. Everyone is encouraged to wear the t-shirt all day Homecoming Friday, and the varsity MHS Homecoming game will be a “gray out” so attendees will wear the shirts for Friday night’s game. The rally will include the Marshalltown High School Band. The current total for donations to date to match the $1 million Martha-Ellen Tye Foundation Grant will also be revealed. All profits from the event and t-shirt sales will benefit the Roundhouse Renovation. For more information about this event or any Renovate the Roundhouse events contact Gary Schaudt at (641) 691-1262. This entry was posted in Alumni News, School News and tagged Homecoming, MHS, Renovate the Roundhouse. Bookmark the permalink.